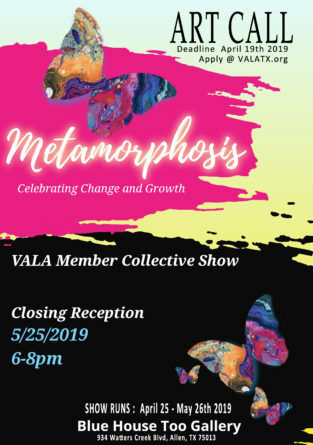 Metamorphosis: Celebrating Change and Growth! We are glad to have you be a part of this exhibit! 2019 Awards approximately $2800.00 in cash and merchandise. Open to anyone, age 55 and over. Entries accepted March 26 and 27 at the C.C. Young Center in Dallas. Artwork will be on display through April 30 in the Point. Limited to two entries at no cost. Awards will be given at the Celebration Event on April 27. Must be a member or associate member of the Farmers Branch-Carrollton Art Association. For information on membership, contact Marcia Bacon at ahoythere21@gmail.com. Forms and entry fee are due by Tuesday, March 26 to Marcia Bacon, 2612 Elmbrook Dr., Carrollton, TX 75010. ‘Unique by Nature’ Juried Art Competition and Exhibition is hosted by McKinney Performing Arts Center (City of McKinney) with help from Arts and Music Guild volunteers. The event is sponsored in part by the McKinney Arts Commission and community leaders. 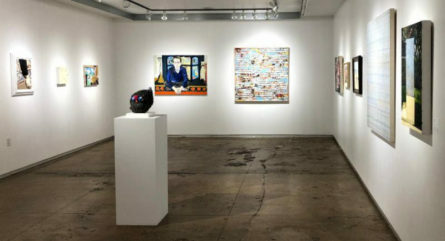 AWARDS:$5000 in cash and merchandise to be determined by the juror after viewing the installed works. 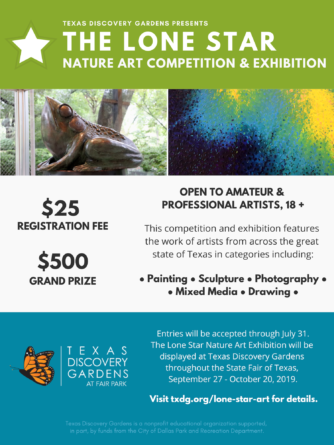 Call for Artists for the RCAS 53rd Annual Regional Art Exhibition & Sale to be held at the Eisemann Center – open to all Texas artists, 18 years old or older. $7,000.00 in cash and merchandise awards. 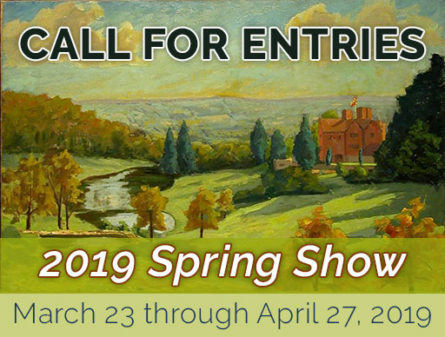 The 2019 Texas & Neighbors Regional Art Exhibition is open to all artists 18 and older living in Texas, Arkansas, Louisiana, New Mexico, and Oklahoma. Up to three works of two-dimensional art may be entered by an artist. This Exhibit will feature Artist’s interpretation of ‘Resilience’. This is a Juried Art show. Submit entries here. Calling all printmakers to submit artwork for “imPRESS,” an exclusively printmaking exhibition for artist ages 18 and up. All forms of printmaking are welcome, including woodcut relief, lithography, intaglio, collagraphs, etc. 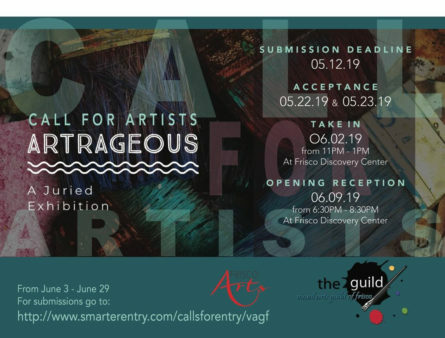 Quickly Approaching Deadlines TAC Impromptu Invitational Spring Gallery Night 2019 This call to artists is open to all active, Texas Artists Coalition members. First, Second, and Third will be awarded each category with a minimum of 15 entries. Honorable mentions will be determined by the Juror . The annual TxN exhibit is back for its 34th year! This five-state competition is highly respected and very competitive. 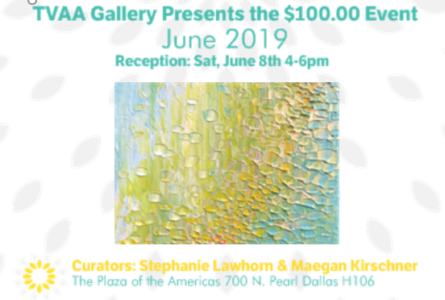 Sponsored by the Irving Art Association and the Irving Arts Center. Deadline is March 1, 2019. See the AVAA Website at www.Arlingtonvisualarts.com. 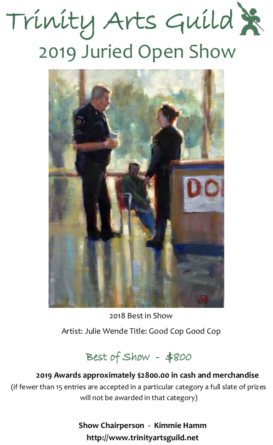 Reception, February 22nd, 2019 from 6:00 to 9:00 p.m.